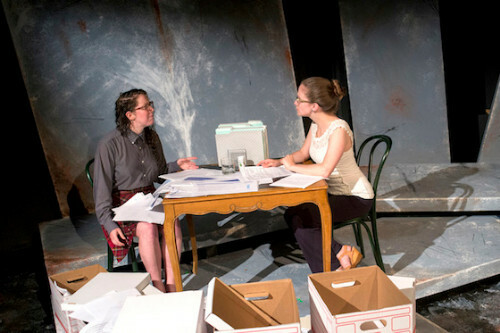 Briana Finegan and Nora Bingham in "The Applicant." Photo by Ariela Subar. I've attended a few short-play productions, where works of 10-15 minutes each purport to capture or represent another work of art or event. Most of them are unsuccessful in staging works of substance, plot or character. That's not the case in First Floor Theater's Third Annual Litfest, Kafkapalooza. Eight different playwrights dramatize or "are inspired by" one of the stories of Franz Kafka, the late great Czech storyteller, who tried to keep his unpublished works from being published after his death. Kafkapalooza runs about two hours with a short intermission, so each play averages about 15 minutes. None of the plays was a disappointment, but the ones I found most engrossing were "The Applicant" and "Red Right Hand" with "Justice for All" and "Unhappiness" by Brett Neveu (inspired by a story of the same name) also compelling. In "The Applicant," directed by Claire Stone, Poseidon appears for an interview at a law school because she's tired of the drudgery and paperwork of her job as God of the Seas. She complains that there's no opportunity for advancement and it's an unpaid job. ("How long were you in your previous job?" the interviewer asks. "Since time immemorial," replies the applicant.) She wants to win an environmental law fellowship and perhaps solve the water problem in California. The interviewer loads the applicant with forms and files. Watery imagery is handled subtly but with comic touches. Kafka's "Poseidon" story is a fragment, just one page, that describes the god of the sea sitting at his desk going over the accounts. He would prefer another job but he really couldn't be put in charge of just one ocean. And his workload doesn't give him time to travel, even though rumors circulate that he's cruising the waves with his trident. "Red Right Hand," inspired by "The Metamorphosis" and directed by Josh Altman, begins with a man and woman sitting on a bed, about to make love for the first time. She decides she needs to tell him something first. Her brother is in the next room and he'll probably hear them. He's undergoing genetic mutation and she tries to describe how he looks and acts. He tells her that he's a Ph.D. in biokinetic diseases and he can "fix" her brother; she doesn't quite believe this. The final line of the play is "Let's go meet your brother." In "Unhappiness," directed by Sarah Gitenstein, a man comes home to his apartment after work, frustrated by long delays on his train ride home. A young woman appears in his apartment; she may or may not be a child and a ghost. They sort of argue but it isn't easy to argue with a ghost. "You never get straight information from them." "Justice for All," directed by Sophie Blumberg, pits a prisoner against her interrogator, who demands that the prisoner describe the torture she inflicted on prisoners, including the interrogator's father and brother. The prisoner describes the torture matter of factly, and points out she was just following orders. Seven of the plays are performed by one to five actors. But "Shrine to Caitlyn Jenner" is a performance piece without a performer. Playwright Ariel Zetina was inspired by "The Hunger Artist," a story about a man who displays himself in a cage in different cities starving himself. "During these last decades, the interest in professional fasting has markedly diminished," Kafka begins the story. "Shrine to Caitlyn Jenner" proceeds after a stagehand places a table on the stage and covers it with flowing fabric. On top she places a tray (stage) occupied by a feminine doll wearing a crown. We are led through a moving homage to transwomen through text projections on screen. Will Cotter is sound and projections designer with scenic design by Bobby Huggins. Between scenes, an actor entertained us developing a relationship with a lobster (or some other kind of arthropod). In the final interval, she dresses the creature in a flowing skirt, beribbons its head, and paints its nails/claws. Jesse Roth and Hutch Pimentel are curators of Kafkapalooza. Their curators' note in the playbill describes how Kafka made beautiful, profound art and influenced some of the greatest writers of the 20th century. Performances of Kafkapalooza are Monday, Thursday, Friday and Saturday at 8pm and Sunday at 3pm. Buy general admission tickets for $15 online. The space has AC, so don't let the heat deter you. Resposted courtesy of Nancy Bishop and Gapers Block.